Matt Fleming of Bangor is pictured dunking while playing for the Maine Renegades AAU basketball team. The junior standout suffered a dislocated right elbow during a game in Gorham last weekend. Bangor Daily News All-Maine first-team forward Matt Fleming is recovering from a dislocated right elbow suffered during an AAU basketball tournament Sunday at the University of Southern Maine in Gorham. Fleming, a 6-foot-6 junior from Bangor, was playing for the Maine Renegades 11th-grade team coached by former longtime Saint Joseph’s College men’s basketball coach Rick Simonds when he suffered the injury. Doctors at Maine Medical Center in Portland subsequently put the elbow back in place, and Fleming is scheduled to see an orthopaedic doctor on Wednesday afternoon, according to his mother Gretchen Fleming. 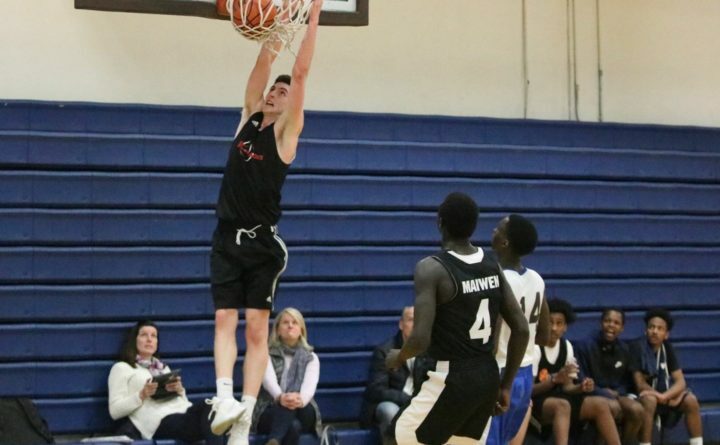 Fleming, who averaged 25 points and 13 rebounds for Bangor High School last season and already has received a Division I scholarship offer from the University of Maine, hopes to be able to return to action this summer. Fleming’s AAU team, which included fellow BDN All-Maine first-teamers Nick Fiorillo of Scarborough and Wol Maiwen of Edward Little in Auburn, went on to win its division of the weekend tournament. Steve Ouellette of Gardiner Area High School was named Robert Lahey Athletic Administrator of the Year at the annual Maine Interscholastic Athletic Administrators Association conference held at the Samoset Resort in Rockport last week. Ouellette, the athletic director and assistant principal at Gardiner since 2013, has an extensive background in athletic administration and coaching. Before accepting the Gardiner jobs, the Winthrop resident served in a similar capacity at Monmouth Academy for seven years after also working at Lawrence High School in Fairfield. The UMaine graduate also taught for 17 years at Livermore Falls High School, where he also coached baseball and football. Gary Stevens, a native of Lincoln and the veteran athletic administrator at Thornton Academy in Saco, was named the recipient of the Martin Ryan Award of Excellence, while Hermon High School’s Rick Sinclair received the Robert Boucher Seventh Player Distinguished Service Award and David Utterback of Brewer High School was recognized for Excellence in Middle Level Athletic Administration. — Nominated for the NIAAA Frank Kovaleski Professional Development Award: Gary Stevens, Thornton Acad.